Since 1993 - Celebrating 25 Years! Imagine gliding down a glass smooth river on your Waverunner, Sea-Doo or Kawasaki Jet-Ski, taking in the sights, enjoying the adventure of new explorations, but relaxing to the fullest because you know everything is taken care of, right down to the last detail. Sounds appealing, doesn't it? 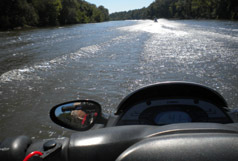 A growing number of people are discovering the joys of river touring on their personal watercraft but are often limited on how much they can do and how far they can go without time-consuming research and a support crew. That's the reason you have Discovery River Tours to rely on for all your River Touring Adventures. We plan the trip and for one all-inclusive* price, we provide you with all the necessities and luxuries to get you down the river to your destination and back. We provide River Guides to get you safely down the river, and a land support crew to service your fuel needs, refreshments, snacks, riverside lunches, and a safe dry shuttle for your luggage. 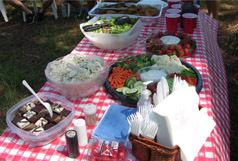 Upon reaching your destination, you'll be treated to refreshments and then shown to your First Class lodging, after which you'll be escorted out for a fabulous dinner. Each trip provides a window of free time for our guests to pursue their own interests once on land, and we can always offer information on things to do. The return trip includes the same amenities as the excursion down-river and is coupled with the excitement of a soon to be completed adventure. Each guest will receive a trip specific T-Shirt, commemorative photos upload and the many memories from a River Adventure you'll never forget. 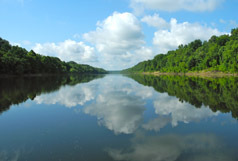 We are currently offering 3-day river tours in the Southeast Region of the U.S. So... Don't be stuck on the lake this summer! 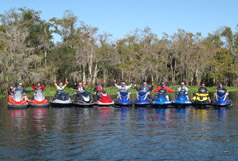 GO PLACES....find fun and adventure with Discovery River Tours providing, the ultimate in personal watercraft enjoyment. 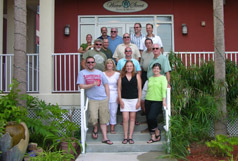 America's original PWC touring company, trusted since 1993. 2019 Discovery River Tours Schedule!! Visit the TOURS page of our website to register! Best wishes for a wonderful Holiday Season from our home base, Lake Hartwell......to yours! Happy Thanksgiving from Discovery River Tours! A time to be thankful for all the natural beauty in our world. Thanks Carey Barrett for the cool drone footage from our July 2018 Cumberland River Tour! Discovery River Tours is a company dedicated to providing the very best in all-inclusive 2 to 5-day guided river tours for the Personal Watercraft (PWC) owner. The company was founded in 1993 by Vicki Williams and Sam Thomas and is based in Anderson, SC - USA. 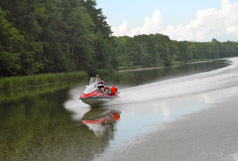 Book your Personal Watercraft River Adventure Now! Reserve my spot on the River!